Foremost, within the aviation domain, China vaunts notable achievements. Having assumed a leading role in military development, its production of state-of-the-art technologies puts the country in good stead to be a major contender to U.S. military power. China’s swelling arsenal poses a serious reality check for the United States and states in the region. China’s Shenyang J-15 Flying Shark (fourth generation fighter aircraft) is based on Russia’s Sukhoi Su-33 Flanker D carrier-based fighter jet. The Chinese People’s Liberation Army Navy (PLAN) began practicing with fully loaded Flying Sharks from China’s Type 001 Liaoning aircraft carrier (a newer, second generation Type 002A reversed-engineered version of the Soviet machine is in the works). An impressive military instrument, the Flying Shark has a relatively limited range of some 2,750 kilometers where its Su-33 counterpart operates at a range of 3,000 kilometers. Beijing has reportedly been disappointed in the overall performance of the aircraft due to numerous crashes and ongoing technical challenges with the flight systems of the aircraft. Questions of the basic operability of the Flying Shark casts uncertainty about the nature of its successors, though Beijing is looking in other directions in terms of military aviation development. The Harbin Z-19E (also known as the “Black Whirlwind”), a light modern combat and reconnaissance helicopter with a sleek and durable design, and developed by Harbin Aviation Industries Group (HAIG) for the People’s Liberation Army Air Force (PLAAF), can perform a variety of military support roles. When the Z-19E entered into service in 2012, it was touted as a considerable leap forward in attack helicopter technology. The unit quickly served as valuable additions to the militaries of other states for its notable features such as high degree of maneuverability, size, and attack capabilities, particularly given its anti-tank and anti-armored personnel carrier (APC) weaponry (HJ-8 missiles and TY-90 air-to-air missiles, AAMs). First developed by the Chengdu Aircraft Industry Group, the relatively new Cai Hong 5 (CH-5, Rainbow 5) medium-altitude, long-endurance unmanned combat aerial vehicle (UCAV) took to the skies in 2009. The CH-5, with its total flight time of approximately 60 hours, has provided a number of other countries with unmanned aerial vehicle (UAV) technology and the ability to conduct precision strikes against a range of targets. With a range of some 6,500 kilometers, and costing just $8.5. million per unit, the CH-5 offers the People’s Liberation Army (PLA) a cost-effective unit equipped with precision weapons to prowl and police contested regions of strategic importance like the South China Sea from an altitude of 11,482 feet. With the help of the China Aerospace Science and Technology Corporation (CASC), the CH-5 was outfitted with a precision guided missile (PGM) in 2017. China has turned its attention to stealth drone technology and the ability to conduct carrier-based operations in China’s littorals. Similar development has been taking place in realm of miniaturization. The SW-6 UAV “Warbot” is a small-scale deployable UAV ideal for tactical operations, including reconnaissance and signal jamming, among other mission types. Exceptionally light, the unit is outfitted with a charge-coupled device (CCD) daylight camera with infrared imaging. The SW-6’s two-way datalink facilitates airborne surveillance and communication, relaying information to ground-based controllers and crews. The relatively small unit can carry a tiny payload in its nose and can be launched from a fighter aircraft, helicopter, or UAV. The SW-6 can be also launched directly in a mission area and operate independently following its release. In addition to its attack capabilities, the unit is equipped with radio frequency (RF) blocking or interference jammers. With a cruising speed of 50-100 km/h, the SW-6 can stay aloft for one hour. The CH-500 UAV co-axial rotary UCAV (helicopter drone), equipped with Blue Arrow 9 (BA-9) air-to-surface (ATS) missiles can effectively reach its targets through an advanced semi-active laser guidance system. The CH-500 is significantly smaller than its UAV counterparts and therefore is an ideal military instrument for supporting small battle formations operating on land. Formations operating on the ground would be able to call on the CH-500 for immediate support through rapid and responsive airstrikes but these units can also be mobilized for operations beyond land. China’s CASC unveiled its CH-805 “stealth drone” a few years ago. The CH-805 has a silhouette similar to Northrop Grumman’s B-2 Spirit, and is launched through the use of two solid-propellant booster rockets. Further developments in the flying wing stealth drone realm include an arrow-shaped unit called the Star Glory SG-1. The CH-805 unit can achieve a speed of approximately 730 km/h and has a total flight duration of 40 minutes whereas the SG-1 is reported to cruise at 600 km/h and can reach a maximum speed of 650 km/h. The Jian 10 (J-10, nicknamed the “Vigorous Dragon”) tactical fighter is an indigenous development and the result of a decades-old program. China’s J-10 is a powerful multirole fighter jet with multiple external hardpoints located from the centerline of the aircraft to the wings. The J-10 is equipped with state-of-the-art weapons and sensory technology capable of executing an attack against land-based and sea-based targets. A viable replacement for the J-7 and Q-5, the J-10 is expected to be manufactured in large quantity to supply all elements of the PLA. Esteemed for its overall performance, other countries have set their sights on the J-10, with Pakistan having received several dozen J-10s in 2015. When China introduced its J-20 Stealth Fighter the military machine immediately captured a swathe of attention and was lauded as a formidable warplane and contender for air superiority. The sleek-looking multirole fighter may be regarded as a gateway fighter for China’s armed forces. Increased attention on the development of stealth technology in a military context suggests China’s vision for stealth military technology has a long projection. Longer and thinner than the F-22 and T-50 PAK FA, the J-20’s advanced electronic systems are comparable to the F-35. Building off the already powerful Russian AL-31 engine, China is striving to create a more potent powerplant for future versions. Beyond its apparent superior features compared to fourth generation fighters, the J-20 is shrouded in secret attributes. 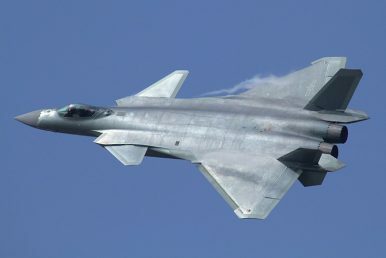 However, given the relatively low-cost of the J-20 (ranging from $30-120 million), China’s defense industry is also well positioned to produce the stealth fighter in hefty quantities. The Shenyang FC-31 (or J-31) stealth fighter and “copycat” of the F-35 was displayed at the International Aviation & Aerospace Exhibition in Zhuhai in November 2012 and rolled out in 2014. Hauling less weight than its rival F-35 (or Joint Strike Fighter, JSF), the J-31 operates at only half the range of the F-35. The J-31 holds a slight speed edge over the F-35. Some analysts have noted that the J-31 could eventually leap past the F-35’s core qualities, including armaments. Still, principle and signature features of the F-35, foremost the JSF’s integrated/targeting sensor suite, continue to outrank systems found onboard China’s J-31. The extent of China’s military investments and expenditures has been disputed as “normal” given the country’s territorial ambitions and relations with neighboring countries. Japan, Taiwan, South Korea, India, Vietnam, and other states have expressed concern that China’s military developments seriously run the risk of destabilizing regional security and pressuring other states to pursue irregular military measures such as massive spending, spending surges, and the search for greater military materials or even attempting to achieve an asymmetric edge. As many countries, principally the United States, maintain a close watch on China’s military spending and development, the need for every country in the immediate area to maintain a heightened degree of military preparedness builds. The disparity in military development and growth taking place acts as one of the most impacting conditions on regional stability. As China’s military activities and probing continue to put other countries in Southeast and East Asia on edge, compelling them to reassess their military arsenals and preparedness, heads of states continue to question the role that every state plays in the region’s short- and long-term security and stability. China has not only seized the leading role in regional military development, it has the stage for potentially dangerous long-term competition with the United States in an increasingly militarized region. Scott N. Romaniuk holds a Ph.D. in International Studies (University of Trento). His research focuses on asymmetric warfare, counterterrorism, international security, and the use of force.